You’ll see different labels on the supermarket shelves-coconut oil, virgin coconut oil, and extra virgin coconut oil. So what’s the difference? Basic (or “refined”) coconut oi is made from dried copra. Most coconuts are sourced from remote villages far away from copra mills where the copra is processed into oil. It is a long journey to the copra mill, so villagers will smoke the copra to keep it longer. Then, after a few months, they deliver a large supply to the mill. The copra is generally smoke-dried but can also be sun-dried or kiln-dried. Smoke-dried copra looks dirty and has a rancid taste, so it must be bleached and cleaned with chemicals. Virgin coconut oil is made from fresh copra. While villagers will toil for months to smoke enough copra to take to the mill, they will use a few fresh coconuts to whip up some virgin coconut oil for their own use. 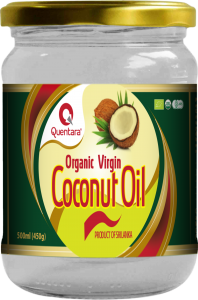 The virgin coconut oil is completely pure-it requires only minimal heating and no refining. It is higher quality and more expensive than standard coconut oil because of course it is more time-consuming to make large quantities of oil from fresh coconuts. Some unscrupulous companies will label their bottles “virgin” or even “extra virgin” if the product is derived from dried copra. As there is no industry standard definition for virgin coconut oil, these companies can get away with falsely labeling their products. The best way to distinguish virgin coconut oil from standard coconut oil is to smell it. The purest, cleanest coconut oil still has the aroma of fresh coconut. Reference : McGRATH, S. (2014). Coconut oil for Health and Beauty. New York: Sky horse Publishing. How Much Coconut Oil Do You Need?